Building on the success of the stellar 2013 show, RAF Waddington was once again looking to pull out all the stops and equal, if not surpass the quality of display items a certain Gloucestershire airshow manages to attract. With sell-out crowds for both days and a varied programme, including some notable display debuts, this author thinks they managed it, but with the future of the airshow in doubt, could this have been the final RAF Waddington airshow? Paul Osborne travelled to Lincolnshire to report on what could possibly be the RAF's last airshow at this historic base. Saturday's running certainly got off to a damp start but all signs pointed to a gradual clearing up of the weather for the commencement of the flying display. As ever the RAF Falcons parachute display team were due to kick-off the display but with a cloud base of less than 1,000 feet they were grounded. The home team, consisting of an E-3D Sentry, Sentinel R1 and Waddington's newest aircraft, the RC-135W Rivet Joint were left to carry out flypasts in the gloom, the aircraft just touching the bottom of the clouds as they made their way along the display line. This year's airshow was certainly a paradise for classic jet fans. The MidAir Squadron sent their fabulous Canberra and one of their Hunters, both in gleaming silver schemes. The Gnat Display Team showed off all three of their North Weald based T1s, and their Yellowjacks and Red Arrows coloured aircraft teaming up with Black Arrows-schemed Hunter T7 G-FFOX to join the nine Red Arrows Hawks for a unique 50th anniversary flypast that illustrated the history of the team, with the colours of their predecessors and their former mount flying alongside the class of 2014. Another Hunter of note was the Dutch Hawker Hunter Foundation's F6 variant. 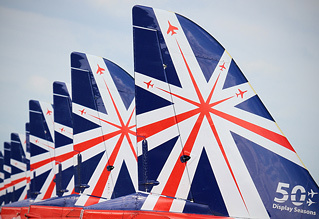 Based in the UK for much of its life, it was acquired by the Foundation in 2007 and painted in Royal Netherlands Air Force Markings. 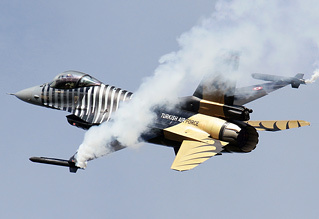 The aircraft deservedly won best display of the airshow. 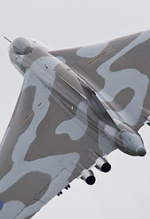 Avro Vulcan XH588 was also on show, for what was likely to be the final appearance at her former residence. One of the highlights was undoubtedly the welcome return of the Swedish Air Force Historic Flight with the mighty Viggen and new on the display circuit, the J-35 Draken. It's a real shame we don't see more of them at UK airshows as they're certainly popular with enthusiasts and the public alike. Modern jets were represented by Swiss F/A-18, the RAF's Typhoon with D-Day invasion stripes and a return visit of the Turkish Air Force's F-16 Solo Turk, which made national headlines in some of the press with its low approach over the A15. 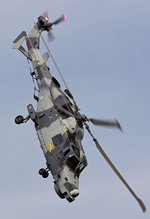 Helicopters shared a large part of the programme with no less than three firsts. The Lincs and Notts Air Ambulance, which is based at Waddington, gave a brief demonstration of how it operates when attending an emergency. The Black Cats are no strangers to the airshow scene with their Lynx pair, and it is welcome news that for selected airshows this year they are replacing one of the Lynx with the Wildcat. Similar to the Lynx in appearance it is an altogether different beast in terms of capability and Waddington was the first public display. 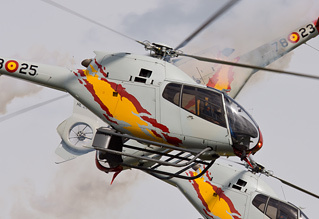 Celebrating their 10th anniversary but first display in the UK were the Spanish team Patrulla Aspa, flying their five Eurocopter EC120s. The team is made up of Spanish Air Force instructors and gave a polished performance of formation and solo flight. A SAR Sea King HAR3 from Leconfield gave a demonstration of its rescue capabilities in what must surely be one of the last displays of the type before search and rescue duties are handed over to the civilian sector. Other rotary displays came from the ever impressive RAF Chinook and AAC Lynx and Apache, the latter's display also featuring pyrotechnics on the ground. Second World War items weren't forgotten. B-17 'Sally B' flew over bomber country as well as the BBMF's Dakota, another aircraft with D-Day markings. The BBMF's Lancaster was joined by two Spitfires instead of the usual Spitfire/Hurricane formation. Their MkLFIXe MK356, also carrying D-Day markings, flew a formation flypast with the similarly marked Typhoon. Two aircraft from very different eras. Fixed wing teams were represented by the Blades, Royal Jordanian Falcons (a three-ship display this year) and of course the Red Arrows. After the team's display on Saturday, there was a minor drama when one of the aircraft suffered a bird strike just prior to landing. The aircraft initially seemed okay as it landed but on the opposite side to the crowd there was noticeable damage to the nose, and the aircraft was written off as a result of the damage sustained in the impact. Tony de Bruyn returned to the display circuit in one of the Bronco Demo Team's OV-10s. Tony was seriously injured at Kemble in 2012 after a practice display when the aircraft crashed and caught fire. After a lengthy recuperation, it's wonderful to see Tony back flying in his second aircraft. Waddington's static display is known for attracting aircraft you'll not see elsewhere and the 2014 show delivered in this regard too. Highlights included the US Navy's P-8A Poseidon and a Turkish Navy CN-235, operated as a maritime patrol aircraft. An operational Turkish A400M landed at Waddington during the preceding week to support the SoloTurk F-16C but unfortunately couldn't be spared to spend the weekend on the ground. A last minute addition to the static display was a newly restored Westland Whirlwind which had flown up from Devon on the morning of the show. Painted in a gorgeous yellow SAR scheme the helicopter was towed to the static park during the afternoon once the Vulcan had been towed out to the flight line. 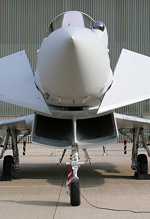 Unfortunately metal barriers were placed close to the aircraft which meant decent photos of it was almost impossible. However this and the inclusion of a Boeing 727 (operated by 2Excel as an Oil Spill Response aircraft) shows the effort that the RAF Waddington obviously put into finding new and exciting aircraft for static displays. The 2014 display once again showed that Waddington can put on a great programme with plenty of variety to suit everybody's tastes, even with reduced military participation. There will be no event in 2015 as the runway will be undergoing a £35m process of rebuilding and lengthening. Beyond this, the uncertainty about the show's return is indeed cause for concern. It would be a tragic loss to the display calendar if the resources couldn't be found to continue what is undoubtedly one of the highlights of the airshow year. Here's hoping for a triumphant return of the RAF Waddington International Airshow for 2016.